So this season’s first snow is here. With dropping temperature and many cold frosty nights, we kind of expected it to snow anytime! Probably snow is one of the best things about winter as the little girl trapped inside my grown up woman’s body come out with mischief in her mind and twinkle in her eyes! Now that I have a partner in crime, my Lil Dumpling with whom I am seen rolling on the thick bed of snow and throwing thick snow balls at unsuspected people especially DH, there is no stopping us from having lot of fun. Except that all the snow just melted away by the time we finished our breakfast as the sun who never showed his glowing face for the past few days decided to grace our world with his brilliance today! Well, it’s just a matter of time before it starts to snow again and I can unleash the little kid in me! Since we are talking about the winter and snow and dropping temperature and all such stuff, we can’t be very far away from talking about winter warmers! The piping hot bowl of thick and creamy soups tops my list of winter warmers and today I am sharing one such recipe which is current favourite of Lil Dumpling. When Lil Dumpling’s key person at his day care mentioned about his love for soups, I knew he had inherited my soup loving genes! 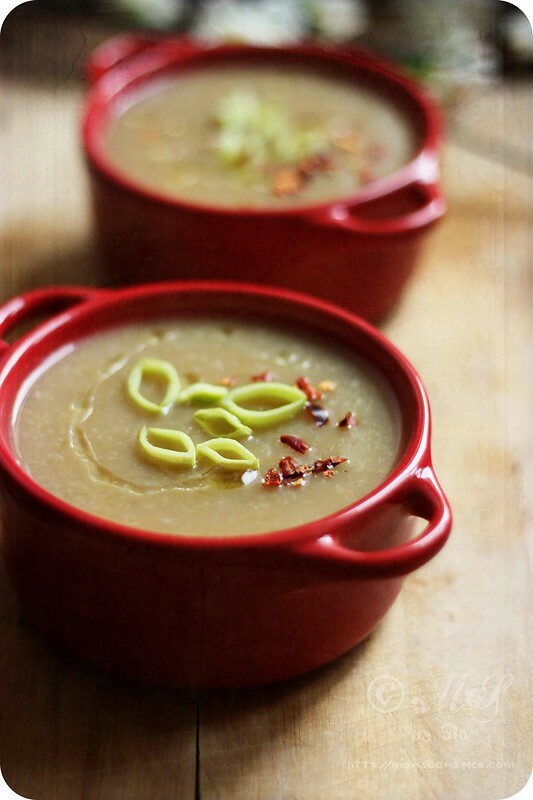 Among all other soups, Lil Dumpling loves this Vegan Leek and Potato Soup the best and sometimes even asks for third helping after slurping two bowlfuls of soups with no threats or cajoling from our part! Now that is what every parent craves for, their little ones not only finishing their dinner but also enjoying them and asking for more of it. There is no greater joy for a mother, or father, when kids love the food cooked for them. 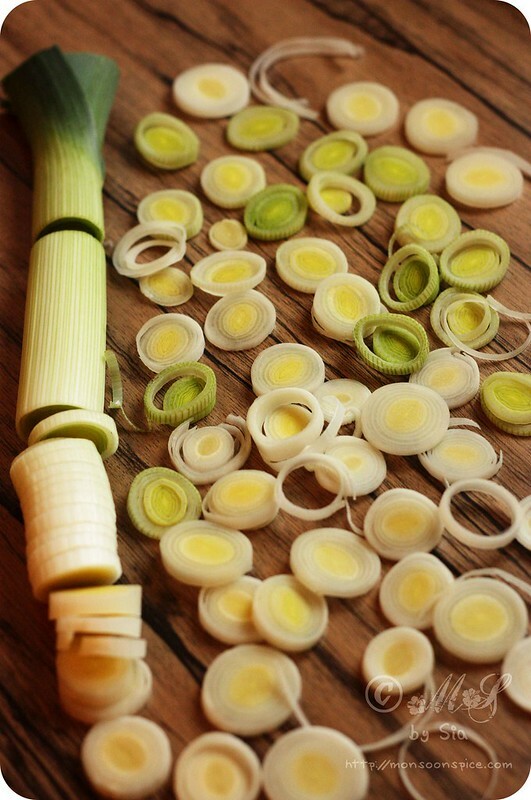 Trim the leeks by removing the tougher outer layers and also discard the green part. The tender white and light green part is what we need for cooking. 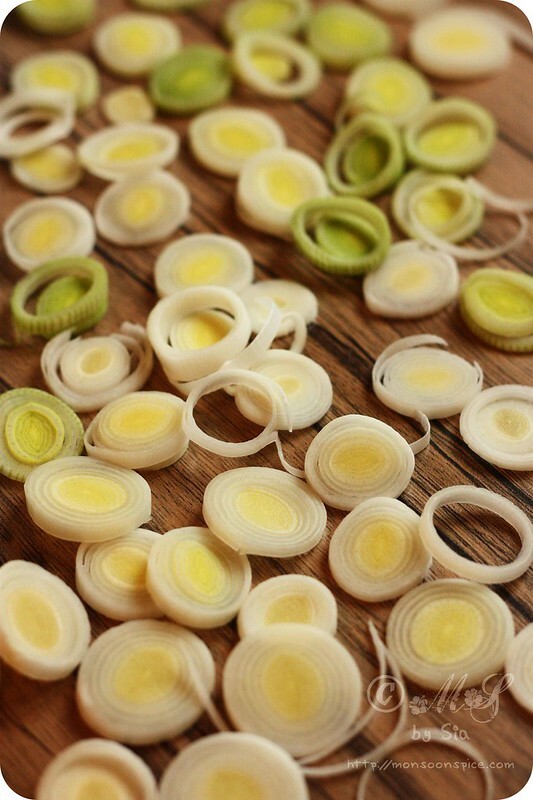 Place thinly sliced leeks in a colander and wash it under running water to remove any grit or sand. Melt butter or heat olive oil in a pan. To this add finely chopped onions and sauté it for a minute. Next add thinly sliced leeks and mix them well so they get nice coating of oil/butter. Cover the lid partially and let it sweat for 5-6 minutes, stirring in between, on medium flame. If you are using the vegetable stock then skip this step. If using vegetable stock cubes then do the following. While the vegetables are cooking, place the vegetable stock in a deep bowl and add 4-5 cups of boiling water. Stir well to dissolve the vegetable stock cubes and keep it aside. Add potatoes and vegetable stock and let it cook on medium heat for 7-10 minutes or until the vegetables are cooked through. Switch off the pan. Transfer the soup to the food processor and let it cool down slightly. Blend the mix to smooth puree in batches. Alternatively you can pass the soup through sieve to separate the liquid from vegetables and blend the vegetables to smooth paste. Mix this vegetable puree with the saved liquid. Return the soup to the sauce pan and freshly ground pepper and salt to taste. Let it come to a gentle boil. 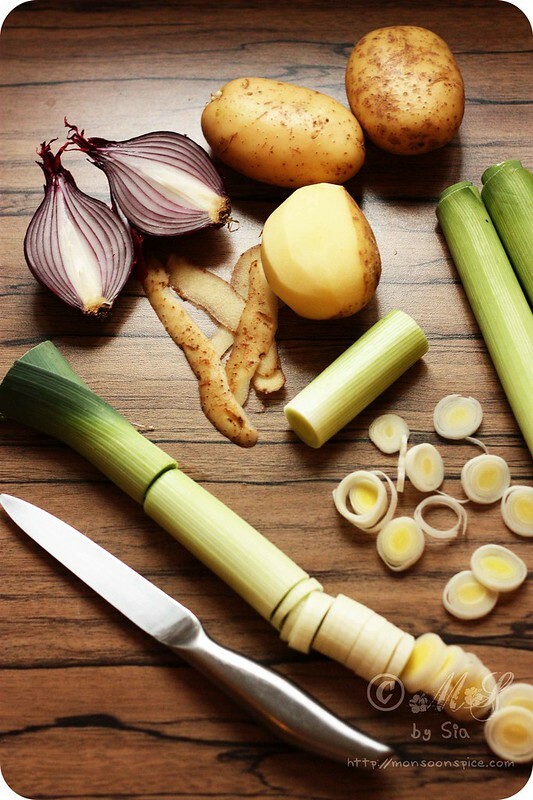 The potato in a soup acts as a thickening agent and the soup will start to thicken when it cools down. So add little more water or vegetable stock depending on the consistency of the soup. 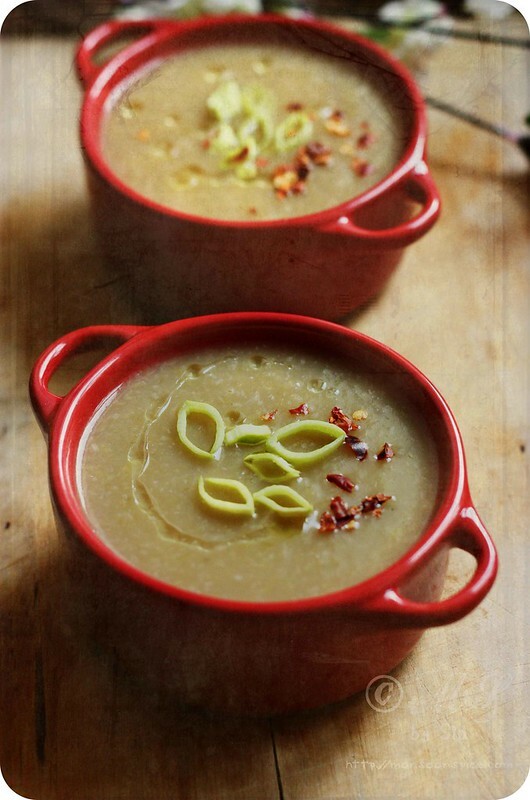 Pour ladleful of this delicious Vegan Leek and Potato Soup into the soup bowls. Non-vegans can add a swirl of cream or cream fraîche on top and sprinkle of finely chopped chives or parsley. Since I made a vegan version, I skipped adding any cream and drizzled some extra virgin olive oil and sprinkled with generous pinch of chilli flakes for extra heat and served with a grilled mushroom sandwich. You can also add a cup of milk while preparing the soup which will make the soup even creamier (remember to reduce the vegetable stock used by 1 cup when using milk). Once the vegetable stock and milk is added, heat the soup on low flame as if you cook it on high heat, the milk may cause the soup to boil over. Next time I plan to throw in a tsp of finely chopped green chillies along with onions for extra heat when making this soup for myself. 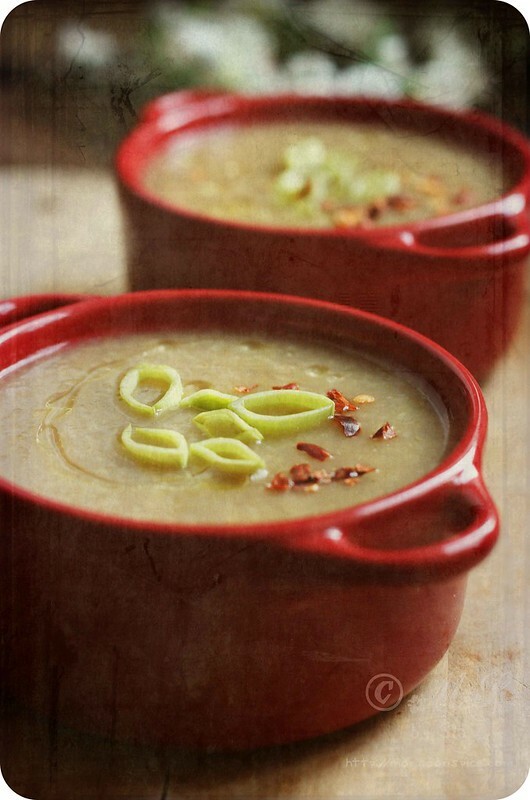 The potato in a soup acts as a thickening agent and the soup will start to thicken when it cools down. So add little more water or vegetable stock depending on the consistency of the soup. You can serve the soup either hot or cold. I usually serve this soup cold in summer with a dollop of thick yogurt on top. The best thing about this soup is it can be vegetarian or vegan depending on the ingredients used. I sometimes add a cupful of milk and serve it with a dollop of fresh cream when Lil Dumpling refuses to drink his daily quota of milk. This way he gets all the nutrition hidden in a bowlful of goodness! Sometimes I also throw in handful of mixed vegetables like carrots, beans, cauliflower, and peas to add some more nutrition to already nutrition packed bowl of soup. Yum! This soup looks good. How do you get your son to eat it? My three year refuses to touch soups. Says he wants rice all the time! Also I was wondering if you had nay slow cooker recipes to share? They would be perfect for the winter! 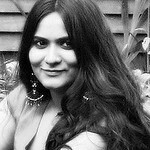 Interesting blog, Enjoyed every post of this site. They have described the process in a very simple way. Thanks for sharing this. 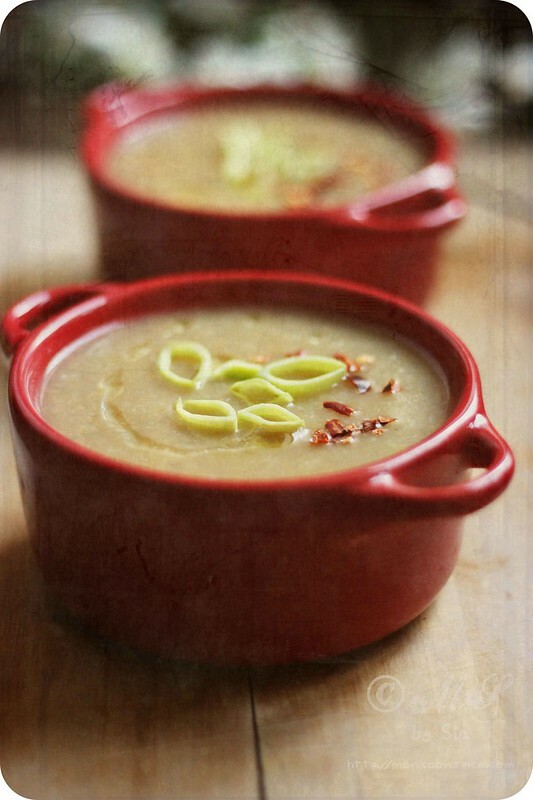 "Vegan Leek and Potato Soup into the soup bowls and add a swirl of cream or cream fraîche" What is might vegans find wrong with this sentence??? Oh dear! My mistake. I can see how it sounds. Since I am not a vegan, it didn't occur to me. Thanks for mentioning the valid point. I will make the necessary correction.